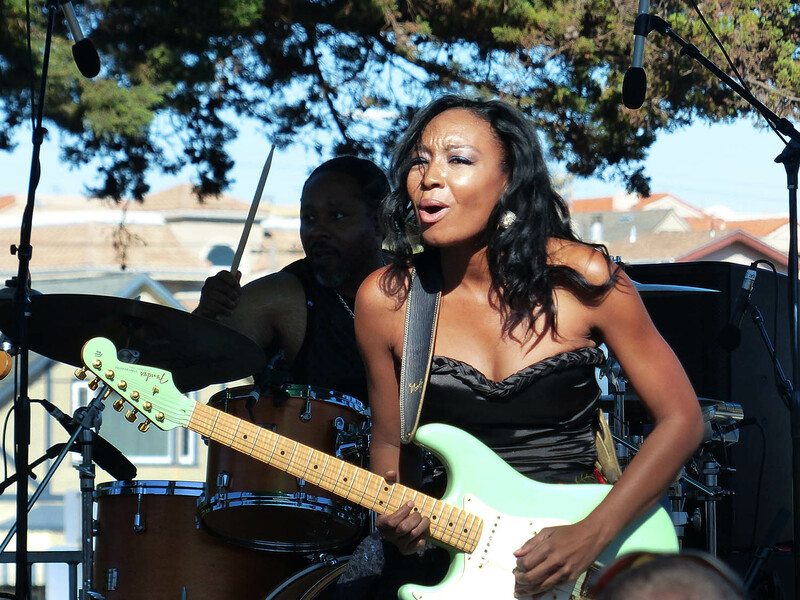 I first met Malina Moye four years ago, during a research interview for the documentary, Nice & Rough: Black Women In Rock. Malina’s energy is infectious, and her determination is reflected in her resume. She is revered as one of the best guitarists in the land – and one of the only women invited to join the “Jimi Hendrix Experience.” So here we go….5 questions and 5 Lbs. of ROCK! SHEILA: Describe your brand of rock? MALINA: I always say Funk-Rock. Rock is the base but the color tones are soul and funk. My goal is to take what influences me artistically from the iconic musical eras, and make it all contemporary. In my live performances, the fans can expect a lot of energy and who knows, maybe even a spiritual experience! SHEILA: As a left-handed guitar player, you are often compared to Jimi Hendrix. Who are the women in rock who inspired you? MALINA: Tina Turner, Heart! The Wilson sisters are incredible. I love Janis Joplin. I love the freedom she eludes on stage. I guess I was always interested in the women who were bringing it on stage like a man traditionally would – but as a woman. SHEILA: What moment was been the highlight of your career – and why? MALINA: There’s been so many good moments. I think one is playing the Rock and Roll Hall of Fame tribute concert for Chuck Berry with Chuck Berry in the audience…and then to rock with him onstage in the finale. It’s surreal when you actually see a person perform. Then suddenly you start running through other artists in your mind and realize, where/who Prince borrowed something from, or The Stones got something from – and it trickles down the line and somewhere, I interpret it into what I’m doing. I felt so lucky to have my life intersect with his at that moment and to hear what he thought about me and my music. I made a lot friends that night and a few of those icons passed away shortly after. It really puts things in perspective. Treasure every moment. SHEILA: You are about to release your new album, “Bad As I Wanna Be,” next month (March 23rd) What is the most powerful lyric from that album that makes you feel good, when you sing it? MALINA: I love songwriting, it’s a part of me. I love telling stories – whether they are my truths or someone else’s. One of my favorite lyrics is from the song Enough. It’s says “when I was young, I thought the world owed me everything. Boy so much has changed. It seems to me, I cannot be what I need to be. The scar’s to deep oh.” I love this lyric. It’s about the scars of being American. I think it’s one of my favorite songs on the album. SHEILA: Do you have a ritual – something special you do – before your performances? MALINA: Yes, my dad tells me that I play with each one of my guitar pedals a few times a piece before a stage performance. Then, I generally walk around the venue before the show and say, “Please be good to me tonight.” I don’t know, it feels like I’m asking for permission to play there that night (lol).